a fake pumpkin, that is. 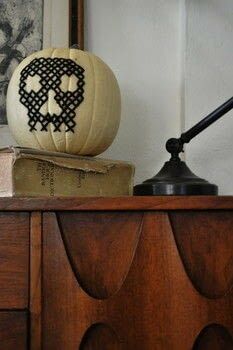 This idea came about when Abbey from Aesthetic Outburst threw a fabulous birthday party with a “hand-stitched/granny chic theme” and as one of the decorations she painted a cross stitch design on a pumpkin. The whole party was beautiful, but this idea was extra awesome and I thought maybe I could cross stitch for real on a fake pumpkin. The project turned out even better than I hoped and so I’m sharing it with you. 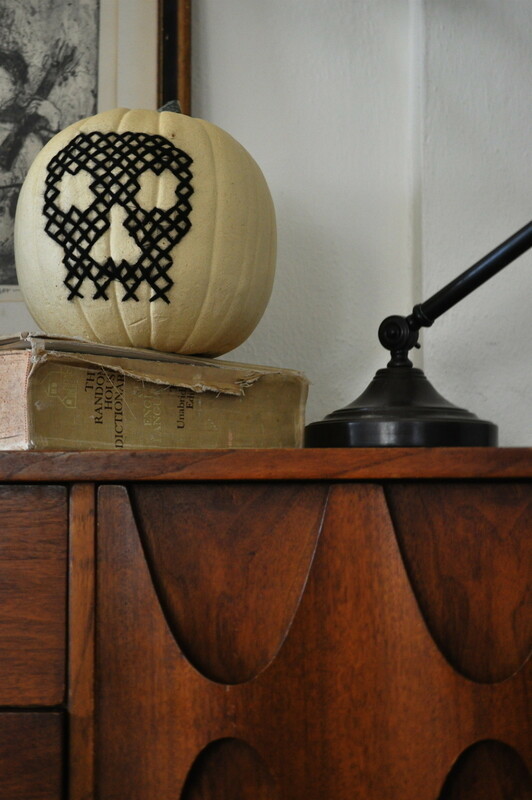 I know there are only 5 days until Halloween, but this is a quick-ish project and the pumpkins will last forever. 1.) First you need to choose a design. I found some great, simple Halloween cross stitch patterns here (http://hobbyloco.com/XSpatterns4.html), but feel free to design your own. It’s easier than you think, I made a bat and a boo! by playing around with Xs in my sketch book (go ahead and copy mine if you like). Just remember, simple is better for this project and try not to put any of the design near the hole on the bottom of the pumpkin because it’s very hard to stitch there. 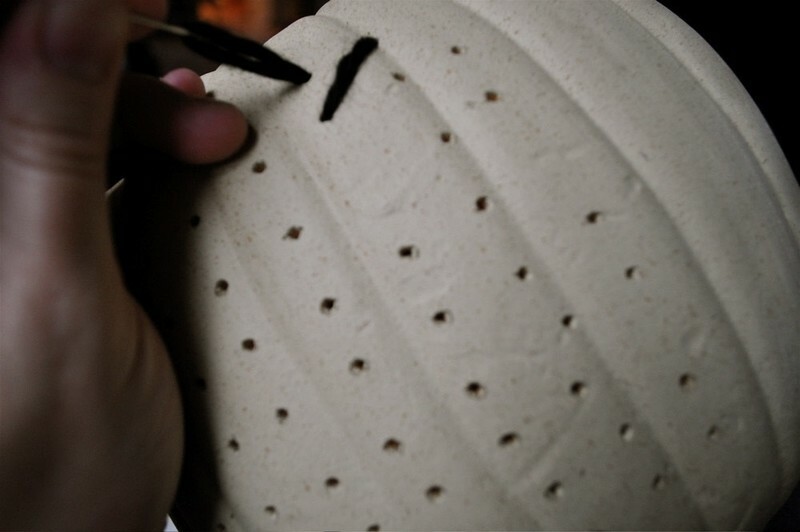 Next, transfer the design to the pumpkin. 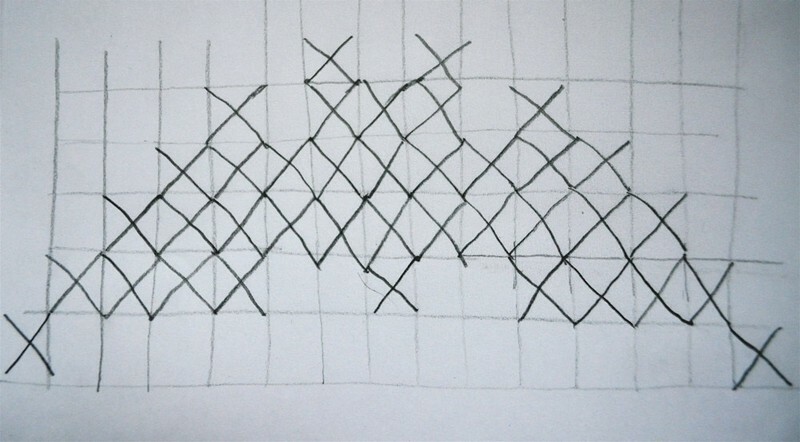 To do this, I looked at the pattern and then with a pencil I made very light dots for where the ends of the Xs go (see photo above). 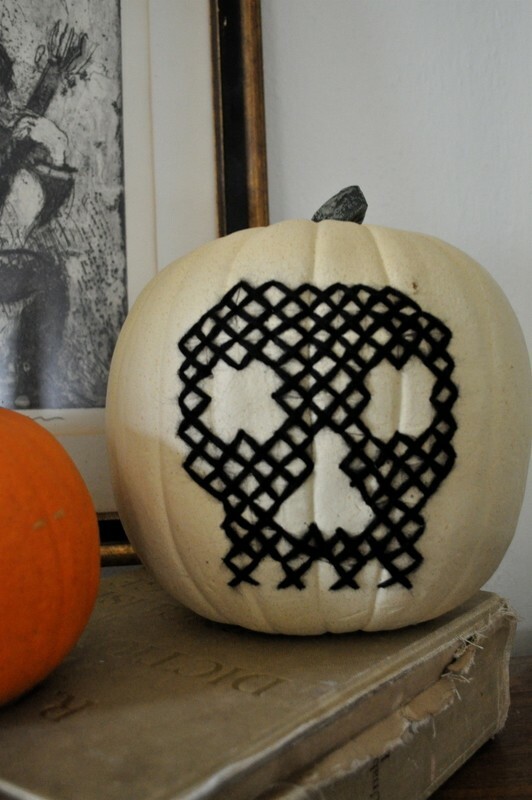 I thought about coming up with some complicated way to get your pattern perfectly onto the pumpkin, but really I love the look of free hand cross stitch and I don’t think it needs to be perfect. If you want, you can lightly draw all the Xs on the pumpkin because the yarn will cover them up anyway. Now you need to poke all those holes. Take the bamboo skewer and poke straight down into the pumpkin. Ok, time to cross stitch. All I know about cross stitch I learned five minutes before I started this project! Thread your yarn needle with a piece of yarn no longer than your arm, no need to tie a knot. 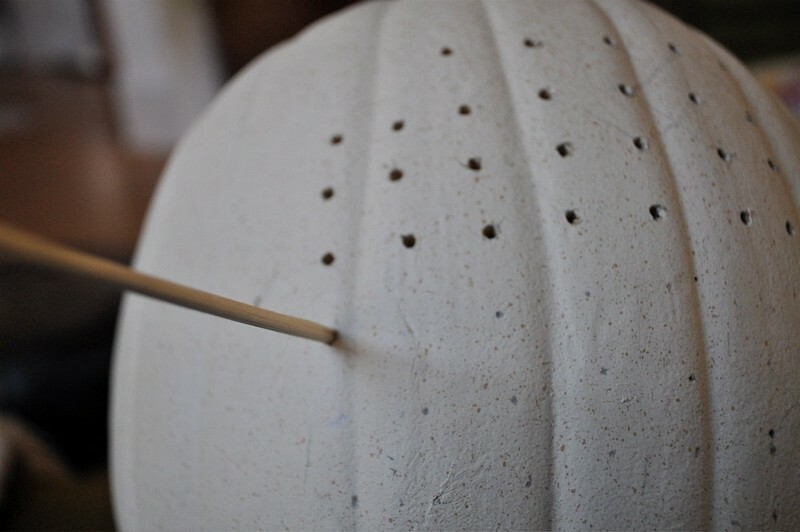 Stick you hand in the pumpkin (if you hand doesn’t fit or it’s a squeeze, do yourself a favor and make the hole a little bigger) and insert your needle into one of the holes you’ve made. It can be difficult to find the right hole. To help, take your skewer in your other hand (the one not holding the needle in the pumpkin) and stick it in the correct hole, then by feeling for the skewer on the inside you can find it and draw your needle through. 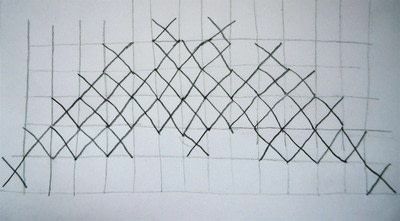 I started sewing at the bottom of my design and Xed my way around until I was done. 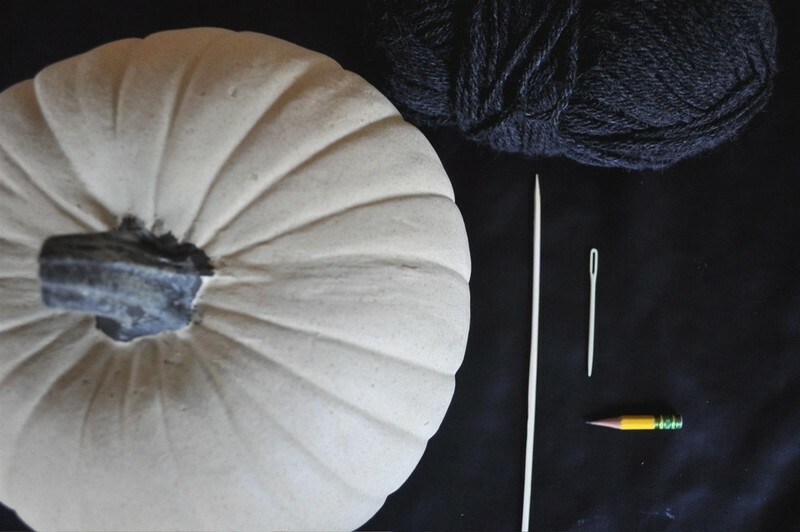 It’s fastest to sew with both hands: one staying in the pumpkin and one out. And that’s it. I think this project could go so many ways. 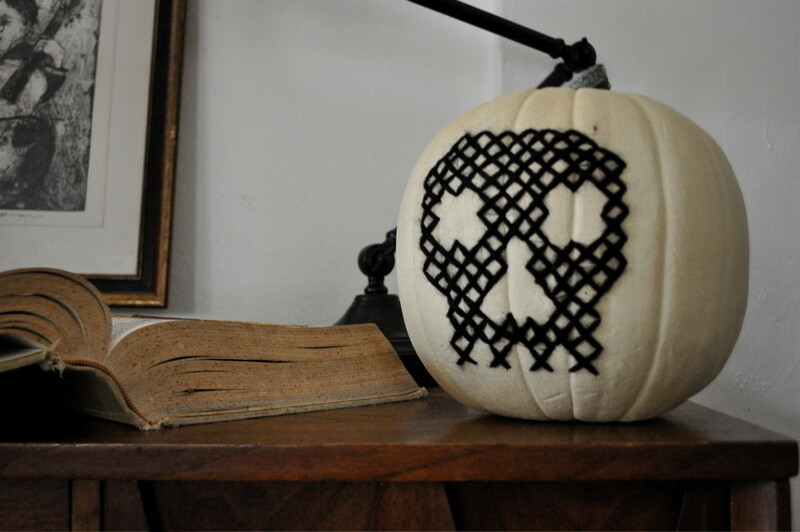 A ghost done on a black pumpkin with some super fuzzy white mohair would look super cool. You don’t need to stick with cross stitch–any simple embroidered design would work. Go crazy with it and if you do be sure to add it to the elsie marley flickr group so we can all see! Happy Halloween! I'm gonna do this this fall. Did you use one of the craft store pumpkins for this?